Imagine this: You’re sitting down on the icy bleachers of Wish Field, the portrait of St. Vinny staring you down and the roar of the train in the background. You’re focused on the feel of the Windy City’s breeze slapping you in the face when you see it- right there in the outfield. A dance, maybe? No, it’s more than that. It’s a handshake- but not a typical greeting. It’s a secret one that’s immediately sending your mind back to the first grade. You can imagine you and your bestie twirling after your very own rendition of patty cake that only you two know. Immediately, you’re jealous. Obviously, you want to know how YOU can once again have a secret handshake like these softball players. But where to start? To begin creating your very own secret handshake, it’s necessary to understand the history of where handshakes come from. They go all the way back to when people were carrying around swords. The extension of one’s right hand, which was the hand typically used to draw a sword or similar weapon, out to their friend or foe, showed that the person meant no harm. When the other person completed the handshake, it showed that the two parties had no ill will against each other and instead came in peace. Now, in today’s day and age, no one is really fearful that someone they’re about to meet is going to stab them with a sword. So the next step in learning how to create your own secret handshake is to understand why people are still shaking hands in the first place. Not only has the shaking of hands morphed its way into an everyday greeting between people, but it’s gone even further to establish a sense of friendship, unity or even secrecy. Handshakes are a form of nonverbal communication, which means that a handshake is “symbolic in the sense that it represents things…but it also means unique things to people you are in a close relationship with,” according to an adjunct faculty member of DePaul’s Communication Studies department, Jamie Campbell. This means that there can be a lot of deeply personal reasons for a handshake. The DePaul bench celebrates a hit during a Feb. 9 game against Green Bay at the Total Control Sports Invitational. 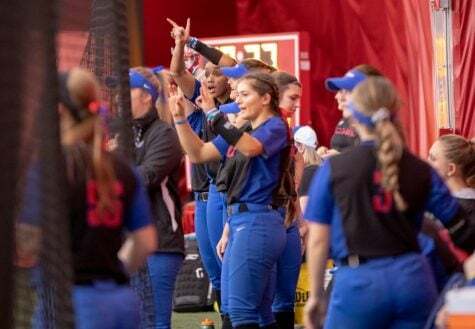 The Blue Demons went on to win game 10-1. One of those reasons is to deepen the connections between team members, which is exactly what you spotted out in Wish Field. When it comes to being on a team, and the softball team specifically, no one handshake is repeated between members. In fact, ritual and superstition seems to be an important determining factor of when people use handshakes today. Many sororities and fraternities across the country utilize personalized secret handshakes that all members must learn as they are initiated. “Our handshake is part of our ritual, which makes it super important,” DePaul junior and Alpha Omicron Pi member Lauren Heise said. However, Heise went on to say that the secrecy was not the most important part of the handshake. Sorority and fraternity handshakes are also a symbol of recognition, and when a member comes across a member from a different chapter, they are still able to connect through the mutual knowledge of the handshake. 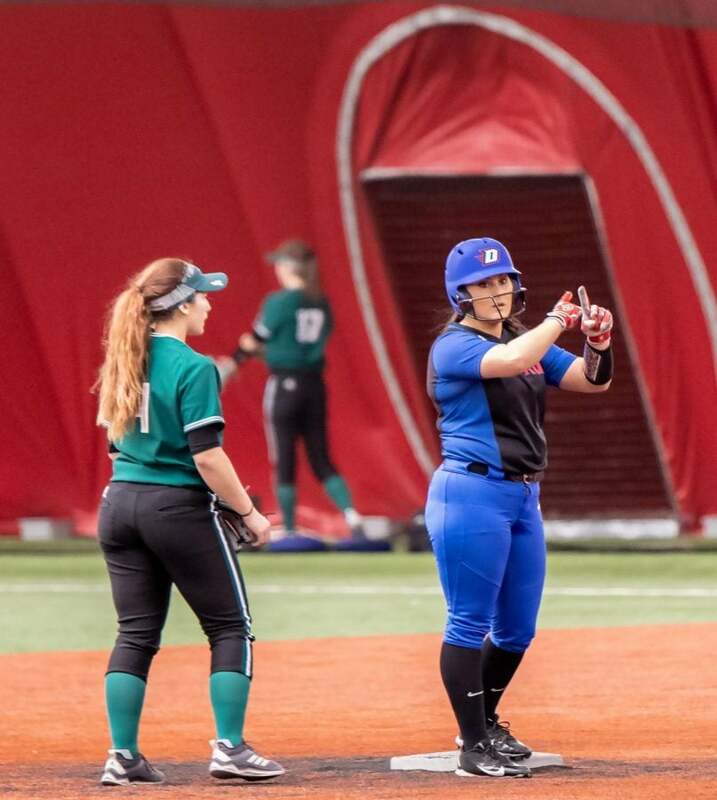 Senior third baseman Alysia Rodriguez (right) and sophomore shortstop Maranda Gutierrez do their signature handshake during Feb. 9 game against Green Bay. The depth of the importance of handshakes reaches far beyond the walls of a gym or frat house. While some societies use code words, several of the world’s most notorious “secret” societies are known to employ secret handshakes. The Freemasons use theirs to identify their own kind among travelers, and even the illuminati is known to have hand signals that only members can point out. 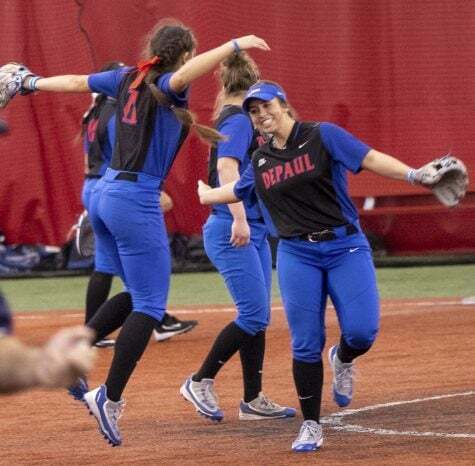 While we can’t necessarily identify how these societies craft their own handshakes, we can look towards DePaul’s outfield to see examples of a good handshake. While the term handshake is accurate in the fact that it usually starts off with some sort of patty cake-esq movements, this is only the beginning. One can sprinkle in any mix of snapping, clapping, clapping on another part of your body such as your feet or elbows, spinning or even a chant into their handshake. The cherry on top is commonly a chest bump or hug of sorts. Unfortunately, in 2015, time stipulations were enforced within games in an effort to reduce the total length of a game. Because of these restraints, there is less time for players to perform their handshakes between plays and innings. Instead they are required to simply get the ball back to the pitcher and resume the game. This varies from when Adix-Zins herself was a player and they used handshakes within innings as a form of celebration. “You don’t see them as much as you used to,” Adix-Zins said. Despite this, the culture of handshakes is not failing within softball or within other sports, or society as a whole. Don’t be surprised if out in Wish Field you see a handshake that inspires you.